Starting this week off full speed! We had two delightful assessments this morning. First was Ari. 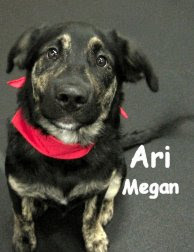 Ari is a four month old, thirty-seven pound, Australian Shepherd/Labrador Retriever Mix. He is a pleasant boy that did darn good in the Medium Roll. Ari played and seemed to enjoy himself. Our second assessment was Buddha. 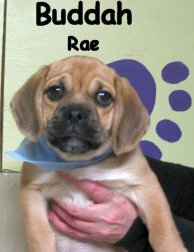 Buddha is a three month old, five pound, Puggle (Pug/Beagle Mix) that is a Little Roll candidate at this time. He headed upstairs and did stupendous, Buddha really played hard. Buddha may graduate to the Medium Roll someday, he is fearless with limitless energy. We plan on seeing these two pups again soon. Way to go you two! I captured a lot of exciting clips from the action today! They were running around so fast that it was hard to find a vantage point where I didn't feel like I was in the middle of a furry tornado! Long time friend of The Fort, Louis, was on TV recently with his pops. Louis's mom Sandy sent me the link this morning, you can check it out here. The first story is very sad, you can fast forward it if you want to. 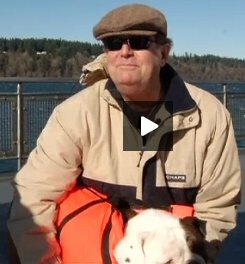 Louis (in his life jacket) and Rick are in the second story about Anderson Island. Have a nice weekend, stay warm! Sammy and Beija get into a Tug of War. Tank and Zoe have been in love all day. Our next Basic Obedience and Leadership Group Training Class starts on Monday the 28th. It is not too late to sign up, there is space available. On Sunday March 6th we will be having another Calm and Balanced Seminar. These seminars have been a hit, they are very informative. Trainer Garrett Stevens does live demos so bring your dog! Apparently we are going to get nailed with the white stuff tonight, looks like it's already begun. Something to note, Fort Fido is always open, regardless of weather conditions (I live very close to The Fort). If you need to cancel your dogs reservation for any reason, make sure to call us. You have until 7:00 PM that day to let us know you aren't coming. Our cancellation policy is very liberal (some places make you call 24 hours in advance! ), you can even leave a message. If you don't call us you will lose the day. Please drive safe tonight and tomorrow morning. No need to call us if you are picking up earlier than your usual time (unless of course it's between 11 am & 3 pm). 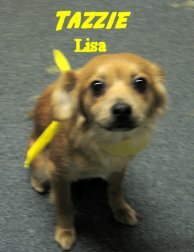 Our friend Barbara Rivers sent us a great email "Easy ways to help the animals" from the Coalition Humane. I thought I'd pass it along, click here to check it out. Two weekends ago I caught some neat "dog stuff" with my wife and parents. Yup, we are even dog-nutty on some weekends lol. We rented the movie A Dog Year (2009) with Jeff Bridges. We really enjoyed it... It is a true story about an author who is going through a midlife crisis and his new rescue dog. The movie was simple and that's what I liked about it. It was a bit vague at times but it's definitely worth renting if you enjoy dog movies. It's like Marley and Me but on a more serious note haha. That weekend I also caught this Subaru Commercial that had me rolling, what a funny idea, great advertisement! This week has already started off full speed despite the fact that it is Presidents Day. This morning we welcomed two assessments Cherio and Buddy. Cherio was up first. 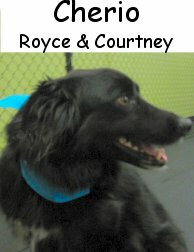 He is a six year old, forty-five pound, black and white, Border Collie that jogged to his assessment with his owner. Cherio is a happy and hardy little guy that we had in the Medium Roll. He was a very good dog but was a bit camera shy. Cherio went straight to play and was quite exuberent. Second this morning was Buddy. He is a nine month old, seventy-five pound, Golden Retriever. Buddy's "Uncle" Hunter has been attending The Fort for years, he's a great Medium Roller. Buddy is a big boy that headed to the Big Roll. He was excited to be here and romped a bit with the pack. Both these dogs did well this morning. They should start to "Bust Out" even more once they get into a routine. A good morning was had by all. Faramir and Cooper (pug) playing on Saturday afternoon. P.S. The Westminster Best In Show has been crowned... 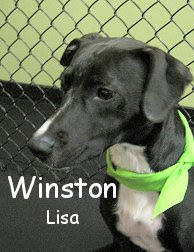 Check it out here, what a cool dog/name! We had two more assessments this morning. What a whirlwind of a week, Friday soon already? Anywho, meet Mia. She is a nine month old, ten pound (? 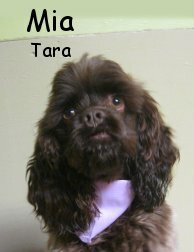 ), chocolate brown and silver highlighted, darling, Cocker Spaniel. Mia did exceptionally well upstairs in the Little Roll. She had a lot of fun with the "Mini Pack" and we all hope she'll attend more frequently. Next up was Marley. He is a one year old, sixty-five pound, spunky, Golden Retriever. Marley was a Big Roll canidate. He took to the pack alright but has some things to learn. Marley is a handsome looking dog, we hope he'll attend more so he can work on his social skills. He wasn't bad (Or he wouldn't be on the blog lol), he was just a pistol. In other news, one of my fellow band members (Yes, I play the Bagpipes in a PipeBand, more on that at a later date) Jeff sent me a link to one of his great video clips. Check it out here... Unfortunately Hector has passed. I'll bet he was an amazing dog, I'm a fan of Cairn Terriers. Our very first customer (almost five years ago) was Faramir the Cairn Terrier (you know, Toto). He still comes to this day. P.S. Check this out, I found it on dictionary.com. Why are they called "Terriers," Pekingese," and Bluetick Coonhounds?" What a neat little article, I learned a few things from it. Welcome two, new to the crew! We had two first rate assessments early this morning. Two dogs from the same family but each was very much an individual. First up was Annie. 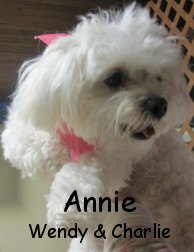 She is a pretty little, two year old, twelve pound, white and cream, Maltese / Bichon Frise Mix. Annie headed up to the Little Roll and did ok. She showed some interest in the other dogs and relaxed as more dogs came in. We think Annie enjoyed the calming effect of the pack. Hopefully she'll bust out and play soon. Second was Murphy. He is a six year old, eighty pound, tan, Labradoodle. Murphy traveled to the Big Roll. He is a very friendly dog that has big, brown, expressive eyes. 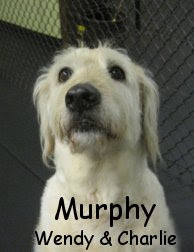 Once Murphy get's used to daycare, we think he will be one of the popular ones hehe. All the dogs seemed to like him but he was just a little cautious. Hopefully it's just first day jitters. Once he gets in the groove he should start having a blast. Way to go Annie and Murphy! We'll see you again soon. P.S. Poll asks pet owners if declawing and debarking surgies should be done, Rare breeds Otterhound and Harrier at Westminster & Westminster dog show 2011: The contestants prepare. First off, I'd like to wish everyone a Happy Valentine's Day. I hope you all have a nice one! I'll start off with my good news... This morning we assessed Bella. She is a one year old, thirty-nine pound, Chocolate Brown, Standard Poodle. 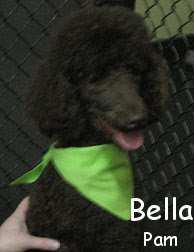 Bella did outstanding today, she spoke great "Dog" and even played with a few different pooches in the Medium Roll. She will be a fine addition to our Medium Pack and sure compliments Jaz and Peaches well. We have had a super track record here (or have gotten lucky) with female Standard Poodles, they've been excellent pack members so far. Now for some very upsetting news, my apologizes... Fort Fido regular (he came almost every day) Hunter was killed by a Pit Bull on Saturday afternoon (2/12/11). It happened in his neighborhood, two Pit Bulls were roaming off leash. One of the dogs attacked Hunter viscouly and then ran off. The authorities were able to capture the other dog but haven't found the culprit. Hunter put up a good fight to live at the emergency vet, he hung in there for eleven hours before finally crossing over the Rainbow Bridge. The saddest part for us is that he played here on Saturday morning, we just spent time with him! So, it is a little gloomy around here, very surreal and frustrating for all involved. Fort Fido has never experienced a loss quite like this. Our hearts go out to Hunter's owners Bonnie and Bob, we are so very sorry for your loss. Please take it easy! With that said, again, have a nice Valentine's Day. P.S. Please note, we do not wish to debate the matter but Fort Fido Doggie Daycare does not except Pit Bulls. We are not stating that they are bad dogs. We are just being clear about our policy here. I Also wanted to leave you with links to a couple of our Hunter clips. Happy Hunter and Other Fiends & Happy Friday (Hunter playing with Fendi and others). 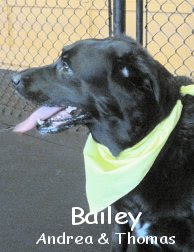 Today we welcomed Bailey, a six year old lab, into the Fort Fido pack! She is going to be one of our Saturday regulars, and we're glad to have her. At first she wasn't quite sure what to make of it, but she soon warmed up to playing with the other dogs. Her favorite game was to chase other dogs around the play area--this is just perfect, because a lot of dogs love to be chased! I think that she's going to make a great addition here. P.S.--Don't forget that the Westminster Dog Show will be this Monday and Tuesday, the 14th and 15th. Click here to learn which channels will be airing the prestigious dog show. And just for giggles, check out these pet relationship survey results. It has been a busy week for us here at Fort Fido but or course that is a good thing. March tends to be our busiest month at The Fort and things are already picking up as we get halfway through February. 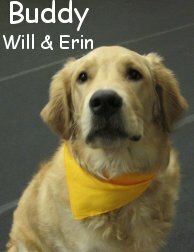 There has been a number of new dogs and old dogs returning... We have also been busy sprucing up for our open house on Sunday March 6th. We hope that you all will attend. We truly appreciate your continuous support. Evy (kumpi@earthlink.net), owner of Kumpi emailed me a impressive video clip. Check it out here. What a neat trick, that dog can really dunk! He dribbles darn good too! I'll leave you with a snippet from today's Medium Roll starring Rainier, Walter, Romeo, Otto and Sophie-Alice. With special appearances by Barkley's and Chewy's head haha. Please welcome miss Lola to The Fort. She had her assessment in the Little Roll today. 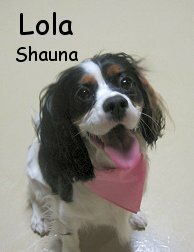 Lola is a one year old, eighteen pound, multicolored, Cavalier King Charles Spaniel. She is a lovely little dog that did quite well with her newfound pack. Lola went to playing rather quickly and clearly took pleasure in her stay. She will be a swell addition to the Little Roll. Excellent job Lola! P.S. What to know about the Westminster Kennel Club Show, Skeeter the tiny volunteer dog shows big heart & study says dogs promote more active teens. This morning we assessed Baxter. 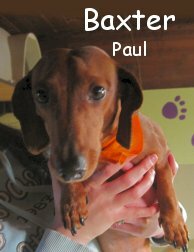 He is a six year old, nineteen pound, brown Dachshund. 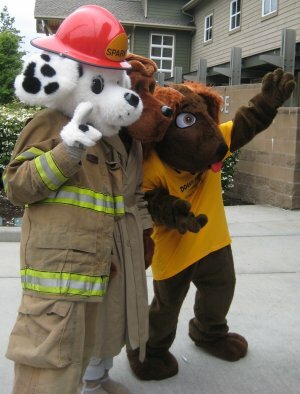 As a young pup, Baxter was a doggie daycare regular in Seattle. Now he is giving daycare another go here at The Fort. He headed upstairs to the Little Roll and did well. Baxter greeted the pack and browsed around, his tail wagged as more dogs came in, he seemed to enjoy himself. We hope to seem him start interacting more soon. Nice job today Baxter! One from the Big Roll and one from the Medium. Enjoy! I hope your week has started off good. Here are some links o' news from today. 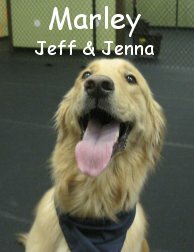 How to prepare your dog for a play group session. Pug for best Super Bowl dog ad? Dog OK after getting head stuck in smudge pot. Dog alerts Aberdeen family to house fire! Diabetes-Smelling Dog sniffs out low blood sugar. Here are a couple clips from the action today. In the first clip you can see little Cooper the Pug playing with Olde English Bulldogge Louis and mixed-breed Blue. In the second clip, you can see Cooper and Chloe the Weimaraner running in circles and sweeping up all the other dogs into it! Hope you guys had as much fun today as the pups here did! Snack Recipe for Puppy Bowl 2011 Hahaha! P.S. Almost forgot... This gal is cool, she has a neat blog and a sweet dog. Happy 4th Birthday Tazzie ! ! ! ! Be sure to snag some of these rad cookies for your dog on the way out. Anxiety & Face Wraps are in! Well, actually not at all, just two great assessments, two nice dogs! First up was Locoe. 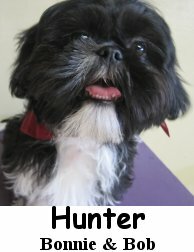 He is a seven month old, fourteen pound, Shih Tzu. Locoe journeyed upstairs to the little roll and explored a bit. He teamed up some with Hunter, following him around and greeting the pack. We here at The Fort think Locoe will begin to play more in time, he should really benefit from doggie daycare because he is young enough. Our second assessment this morning was Peaches. 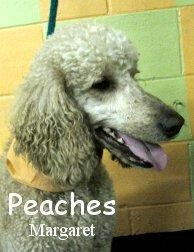 Peaches is a two year old, forty-six pound, apricot colored, Standard Poodle. 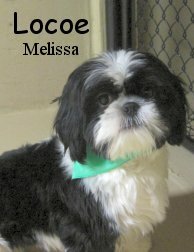 She is a rescue dog that has a great new family... Her new sister is Jaz, a Fort Fido regular that does wonderful here. Peaches entered the Medium Roll with new sis Jaz and flourished! She is a real go getter that met the pack and fell in love, playing a lot, especially for a first day. When I put my pooch Gibson in, he and Peaches hit it off right away. Way to go Locoe and Peaches, awesome job today!